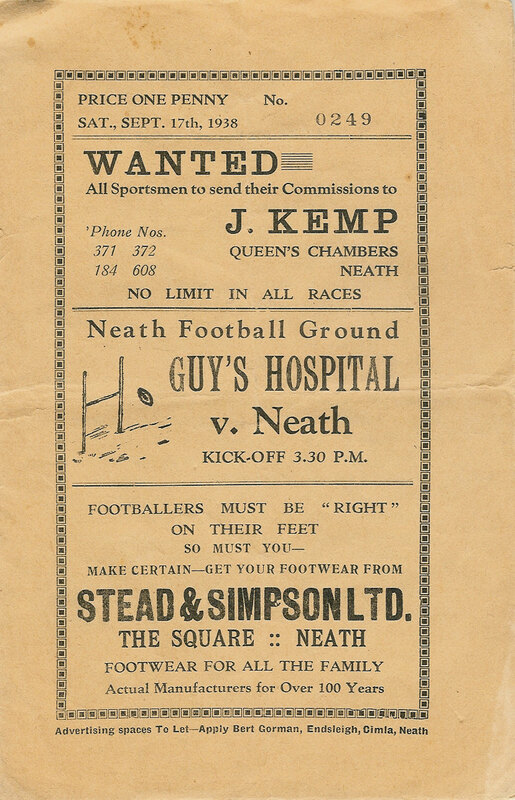 Neath Rugby Football Club is the oldest club in Wales, their origins can be traced back to 1871/72 when the first recorded match took place against Swansea, the outcome was “disputed” ! 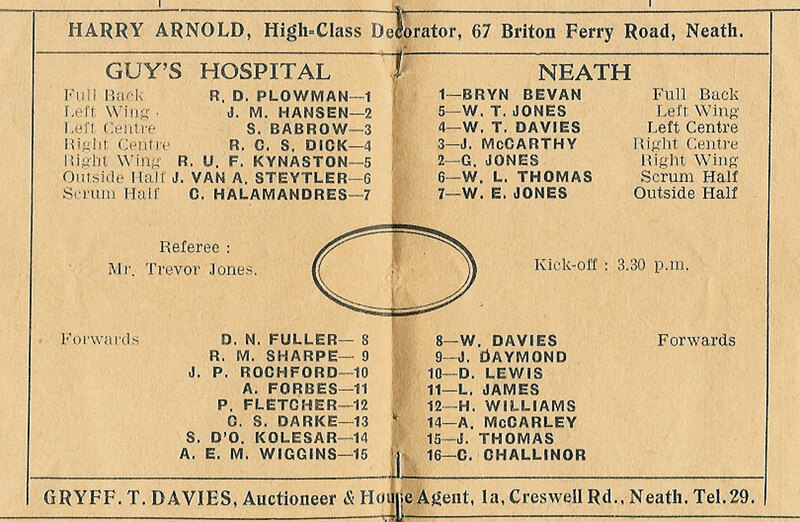 Neath’s first captain was Dr. T.P. 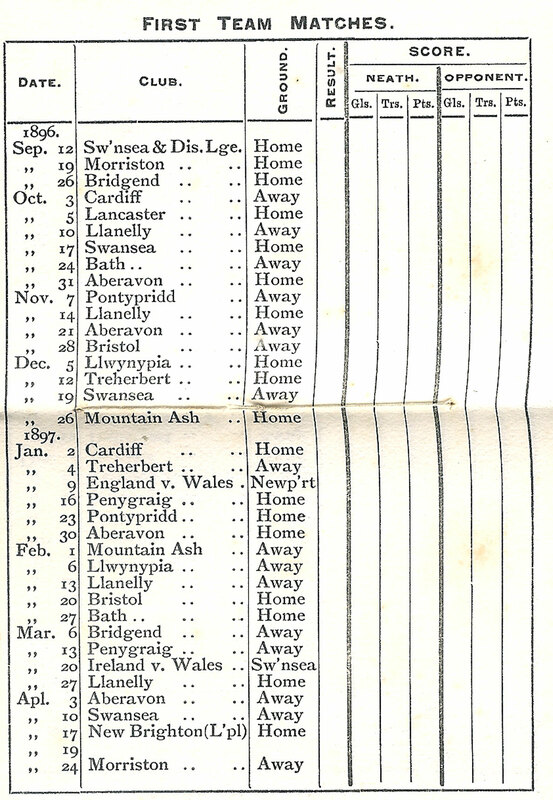 Whittington who was capped for Scotland against England in 1873. 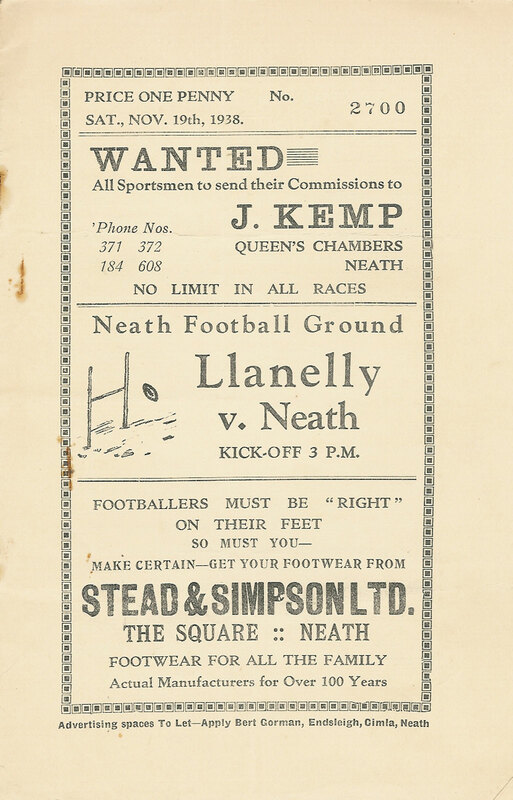 In 1874, a 17 year old, Sam Clarke, started playing and he was to become the Club’s first Welsh international when he played for Wales in their second fixture and first victory against Ireland in 1882. 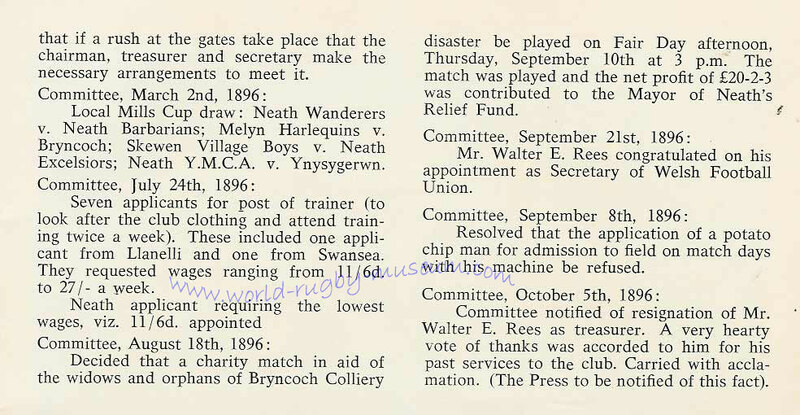 An able administrator, he was the last secretary of the South Wales Football Union, the forerunner to the Welsh Rugby Union. 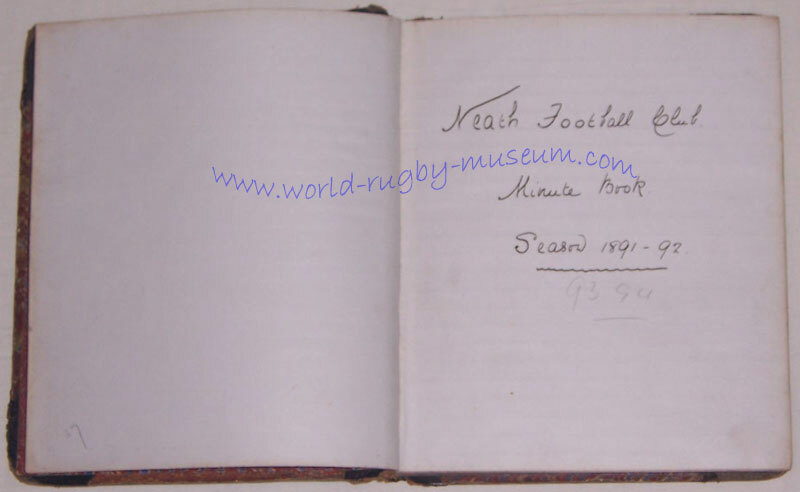 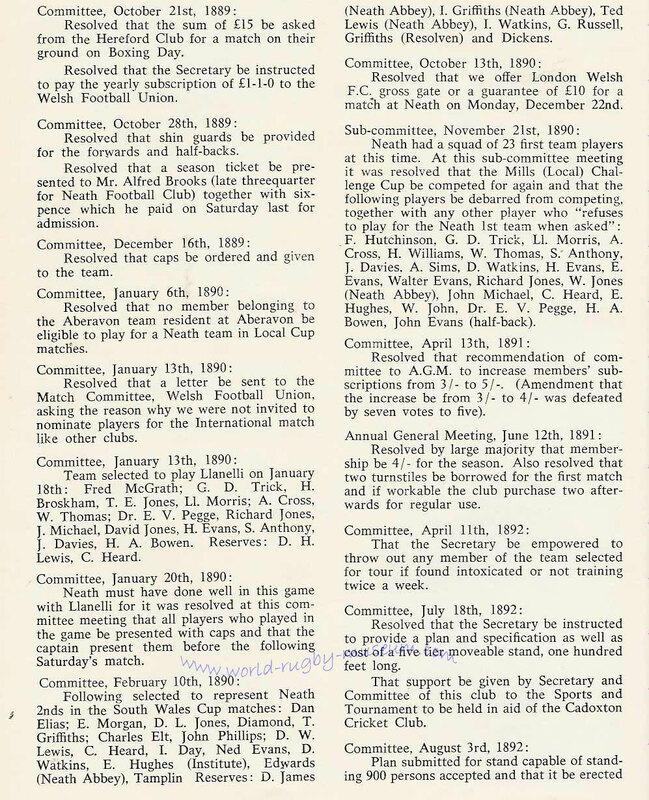 He also became secretary of Neath RFC and his efforts in keeping the club minutes can be seen in the early 'minute books' in our Museum Collection. 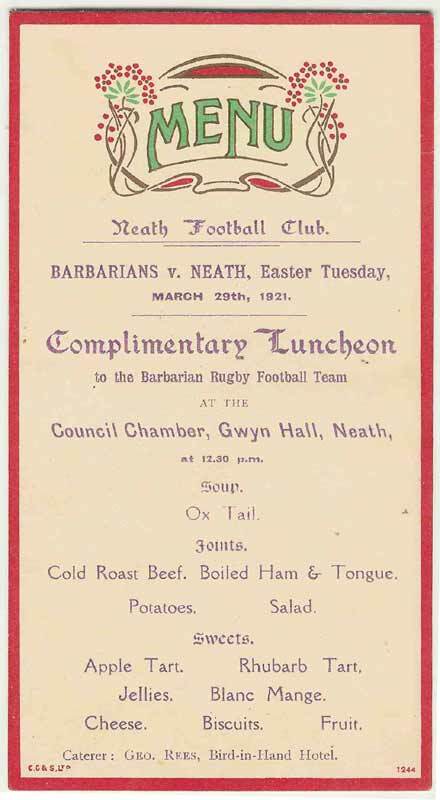 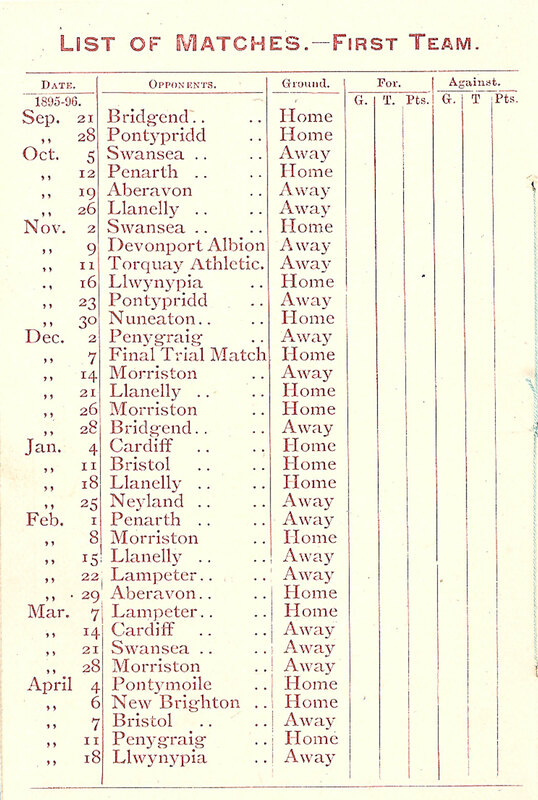 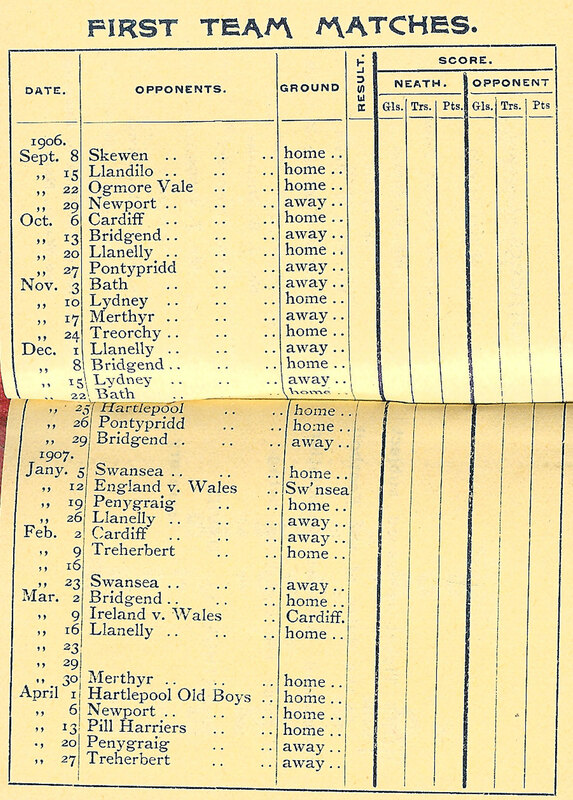 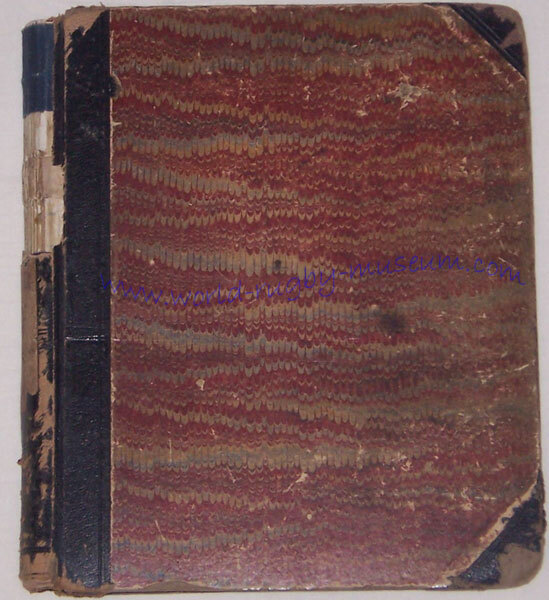 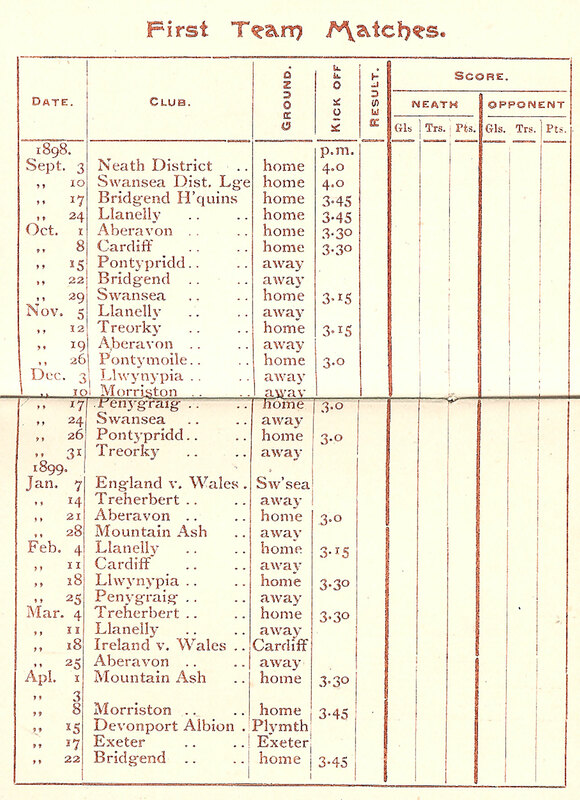 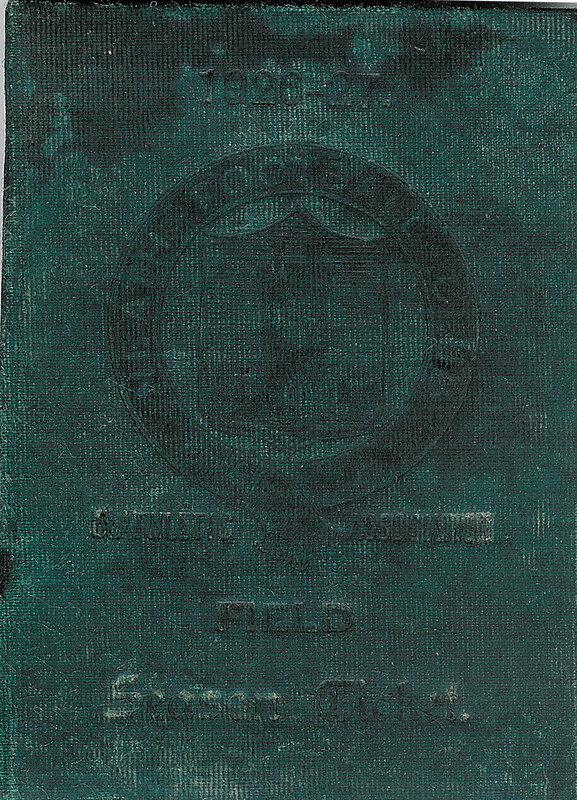 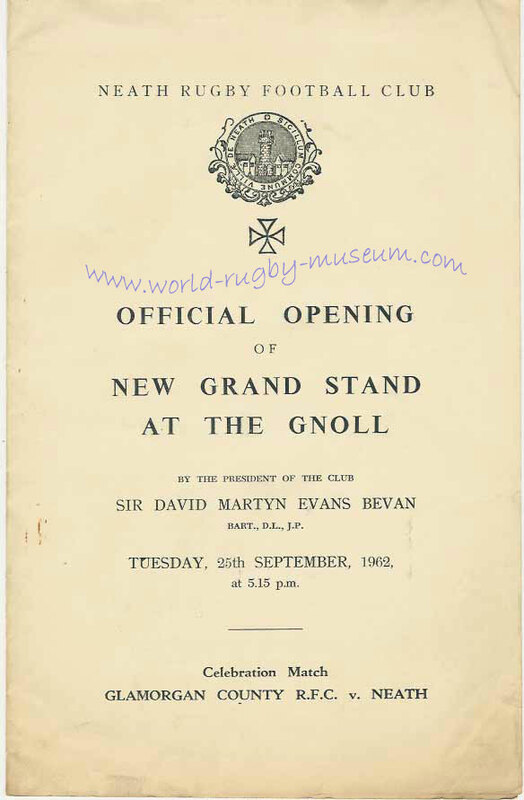 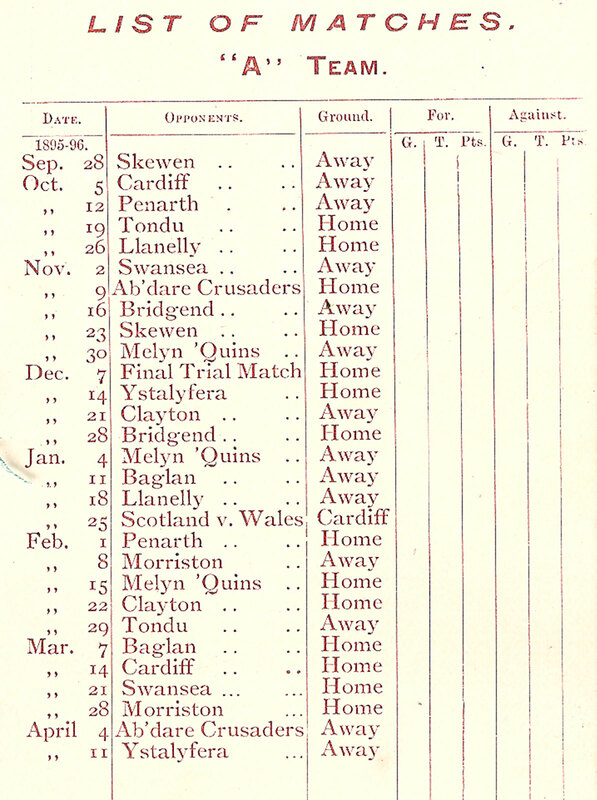 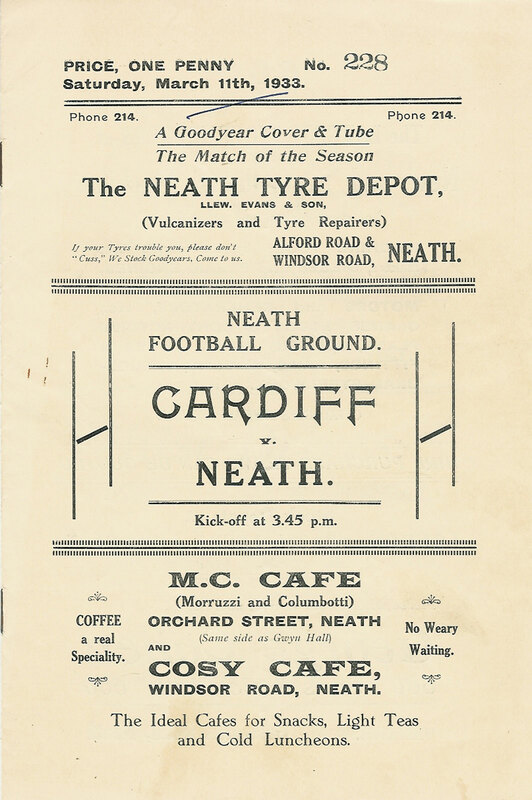 To view these books which are the earliest known records of Neath RFC please click on the image below. 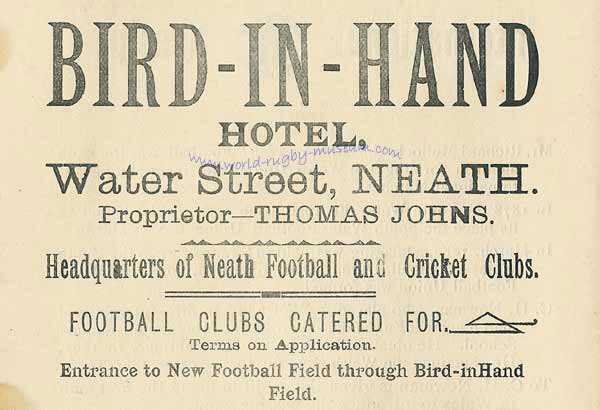 The Bird in Hand Field is where the old Civic Centre and car park opposite now stand. 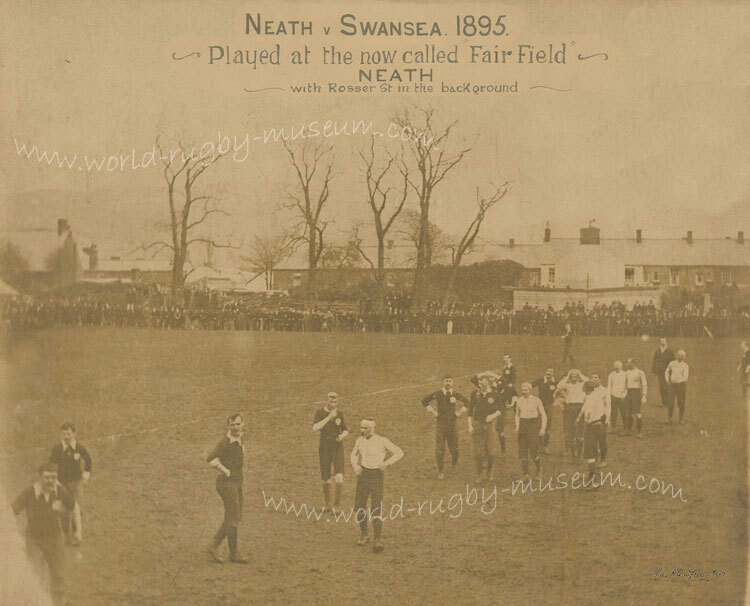 Rosser St is still standing, the Gnoll is approx 75 metres to the right of the photograph. 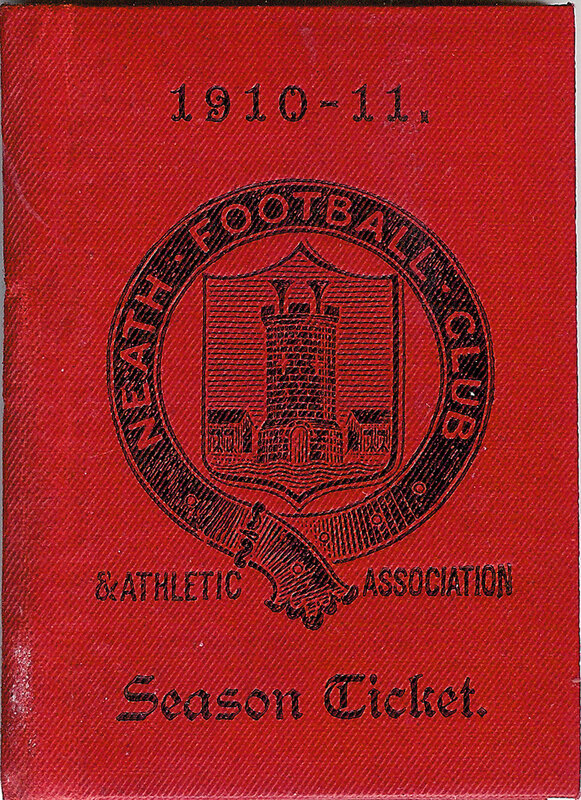 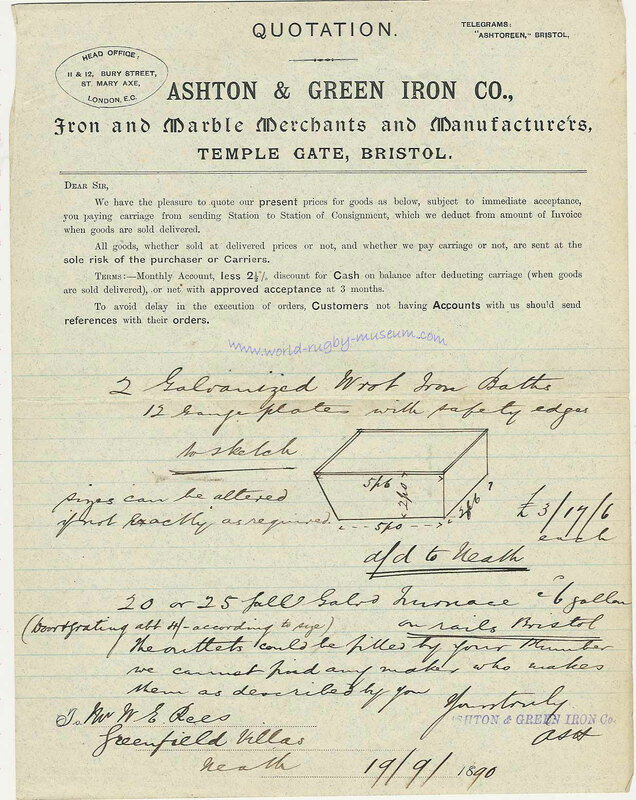 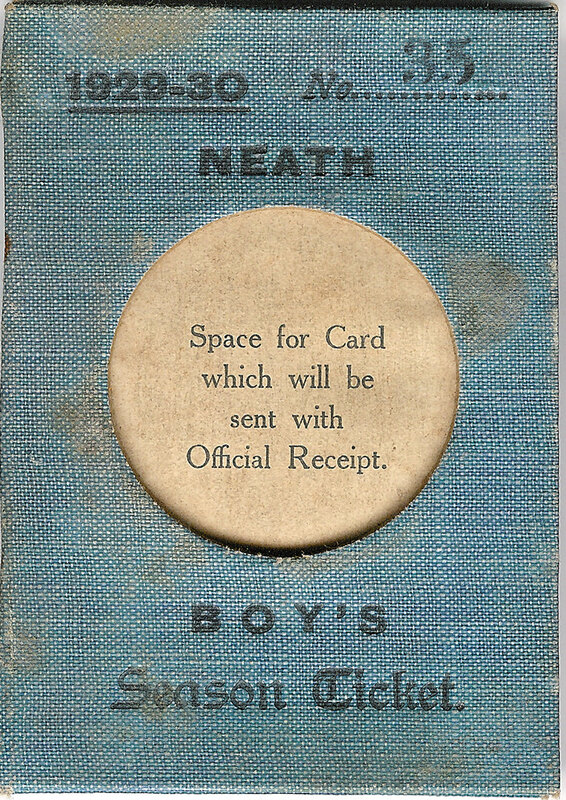 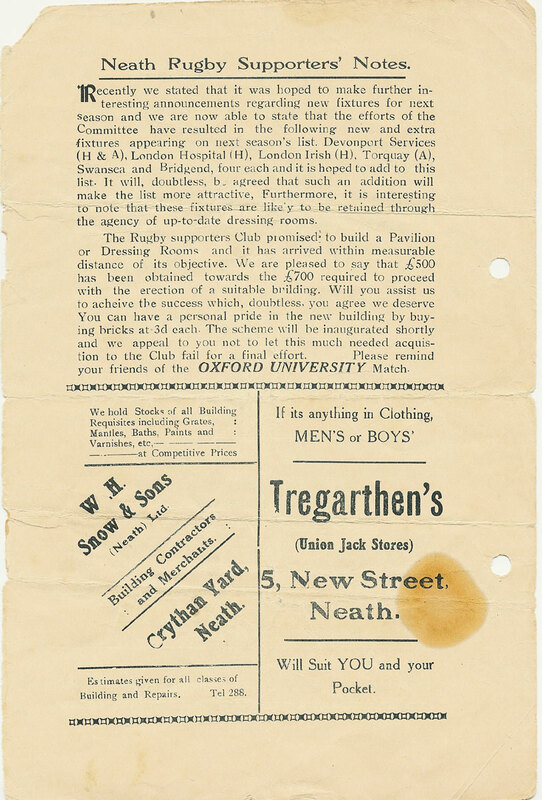 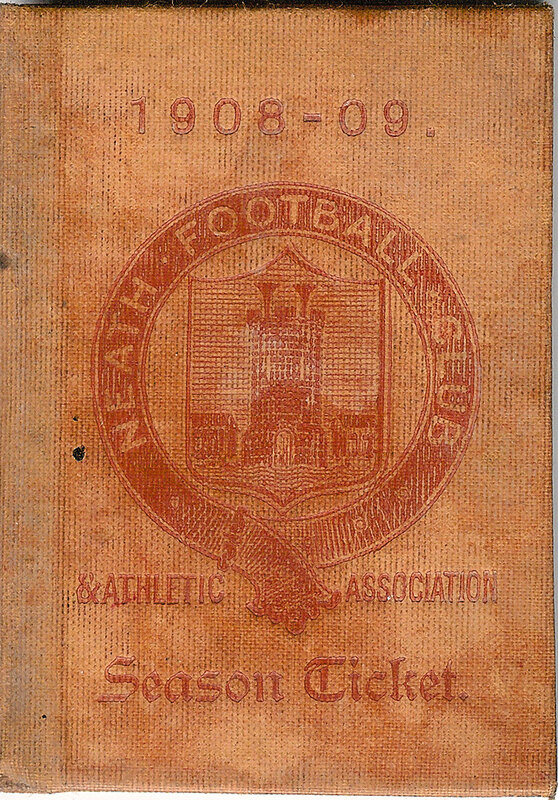 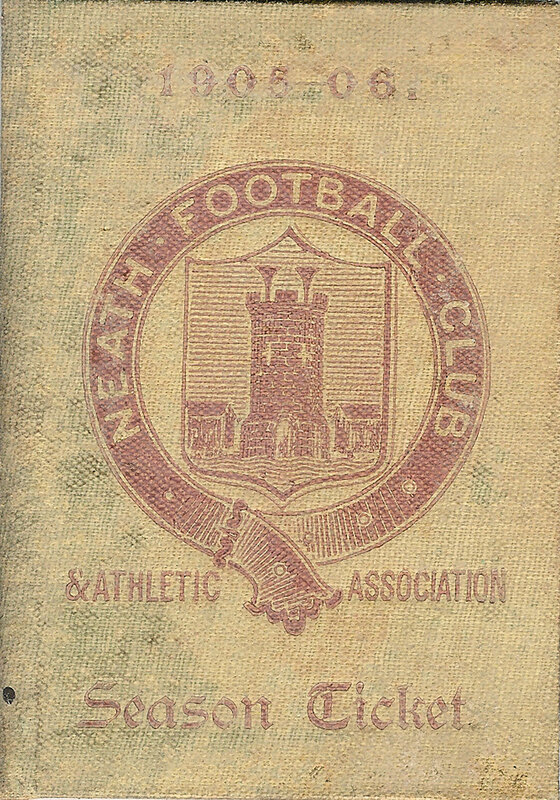 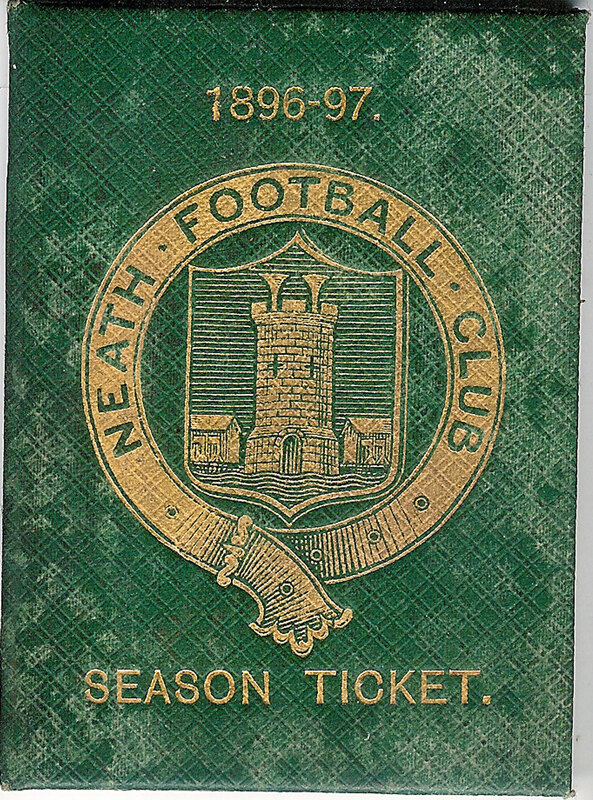 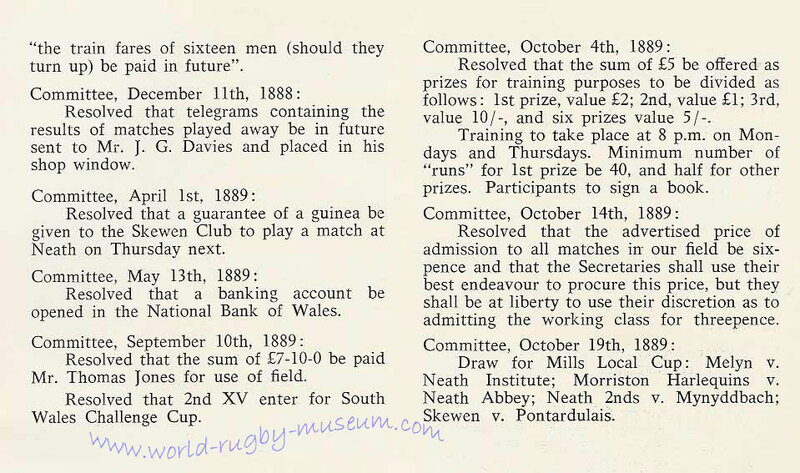 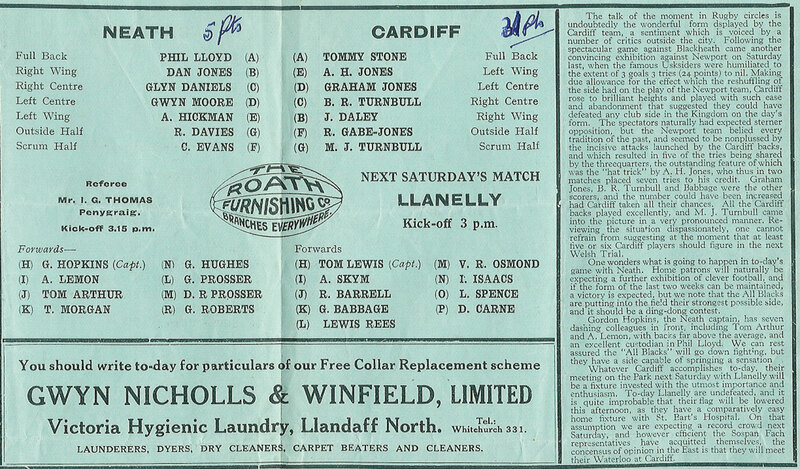 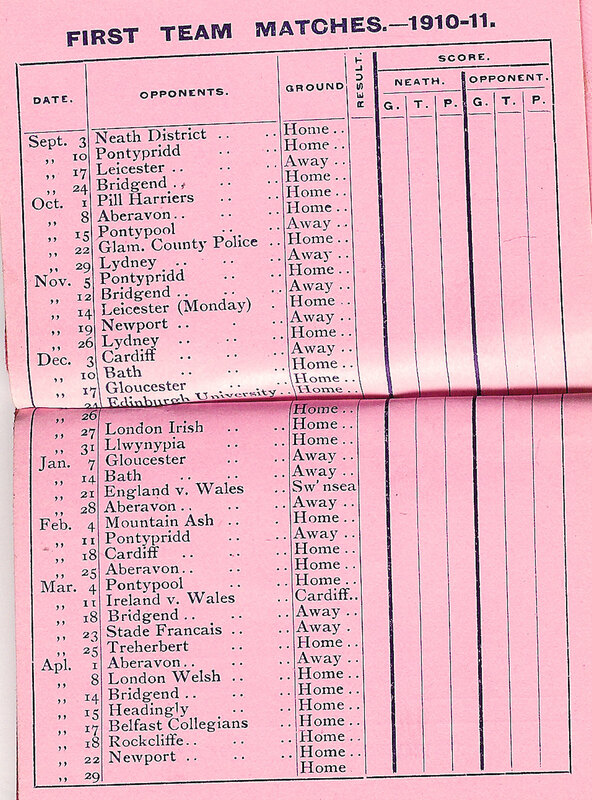 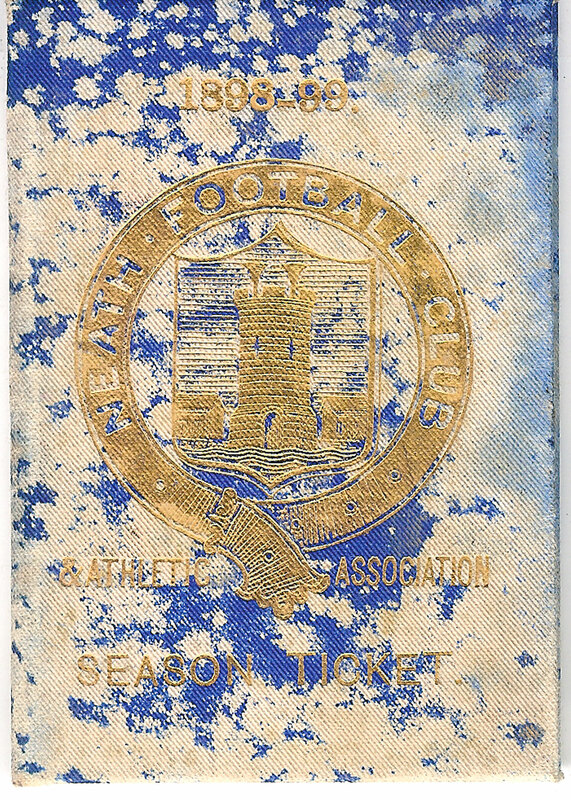 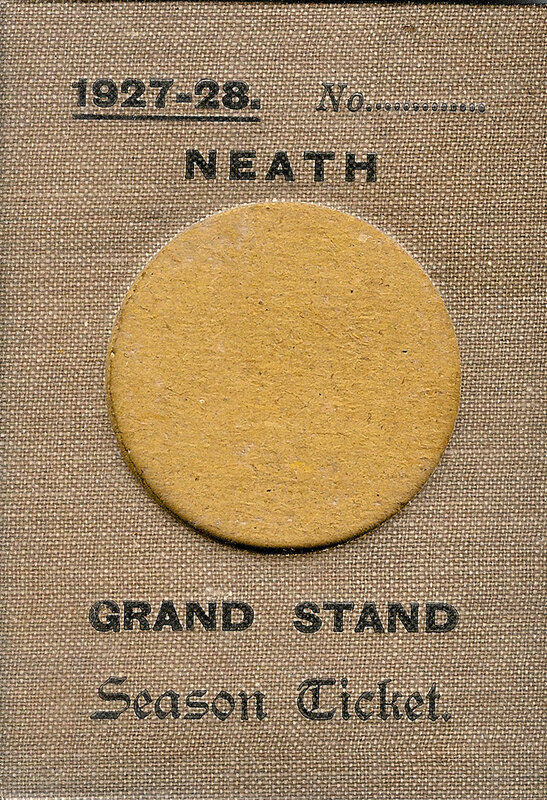 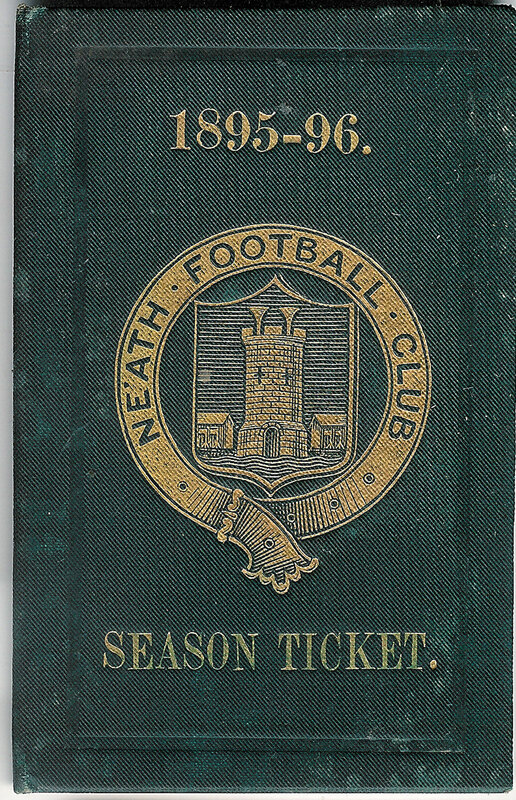 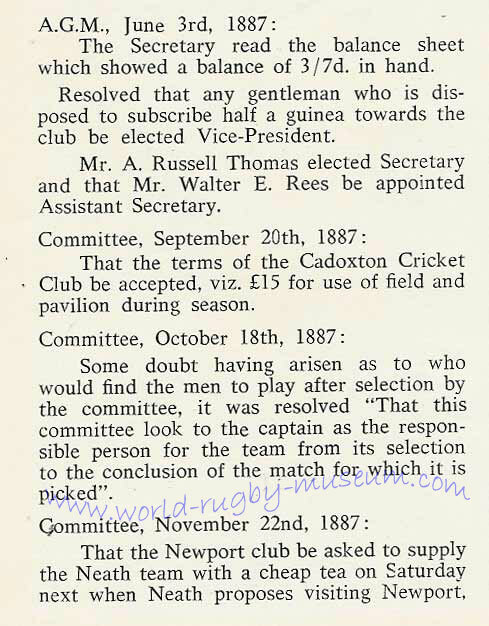 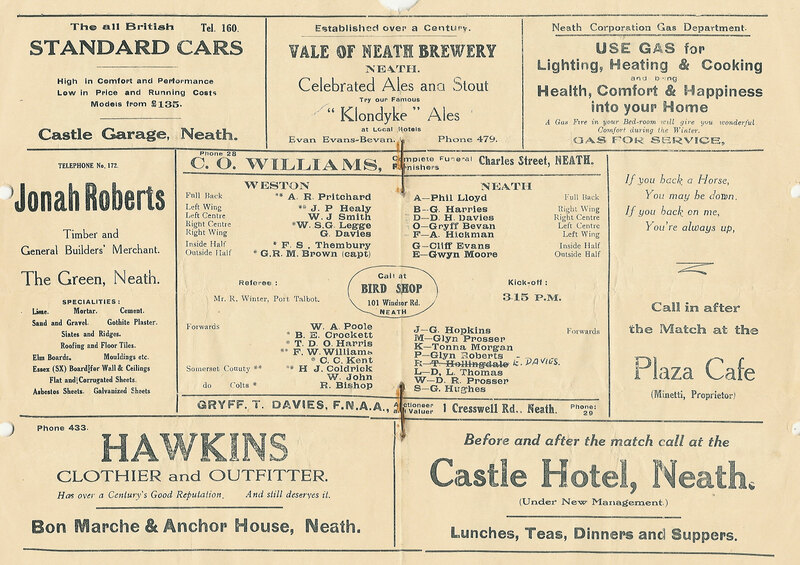 The early days of Neath RFC saw the club move both headquarters and grounds on several occasions, financial considerations were always top of the agenda. 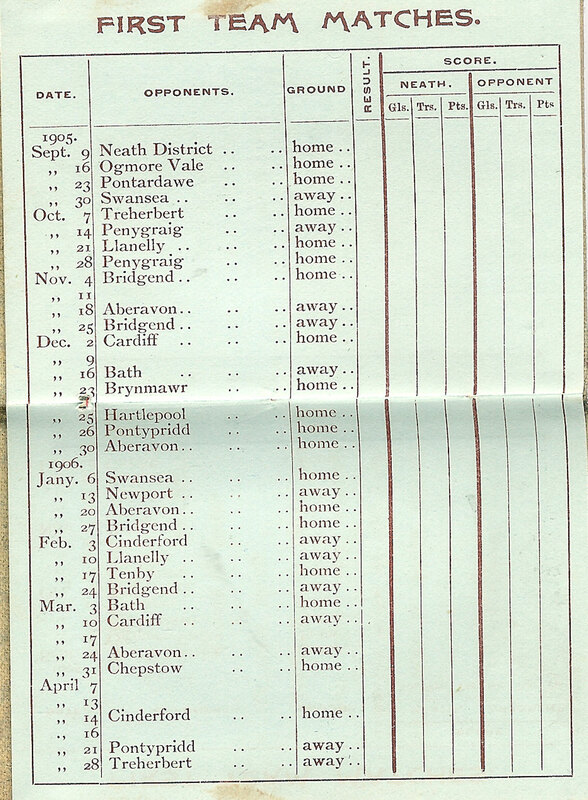 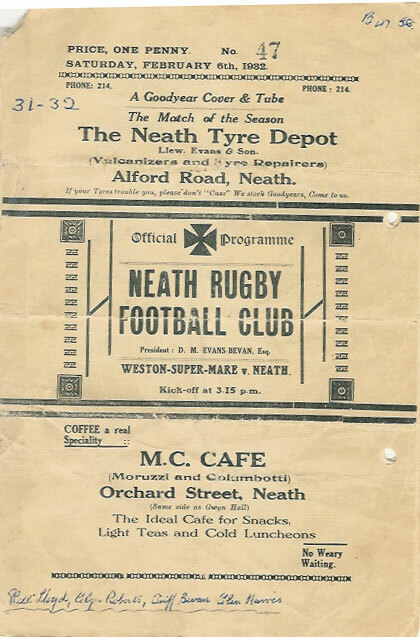 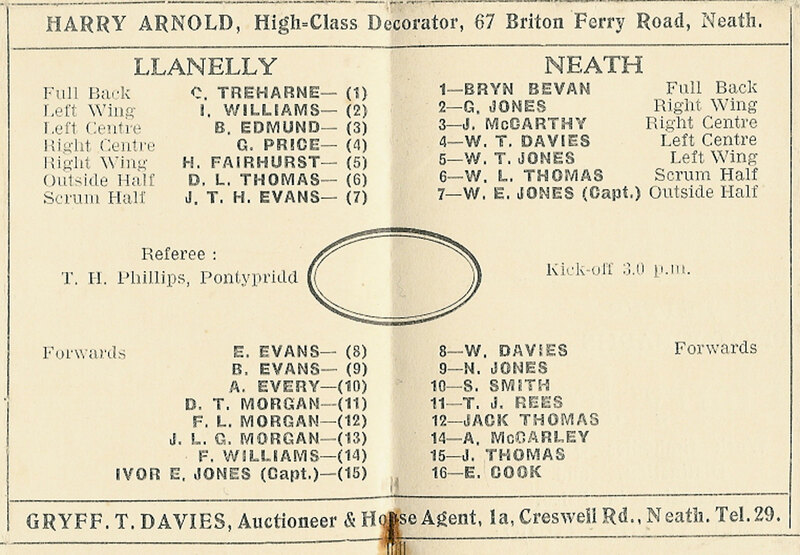 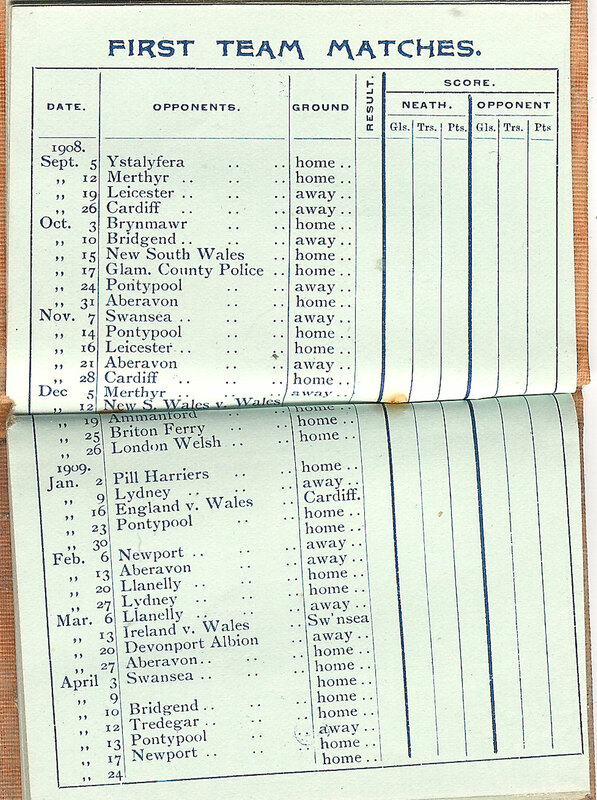 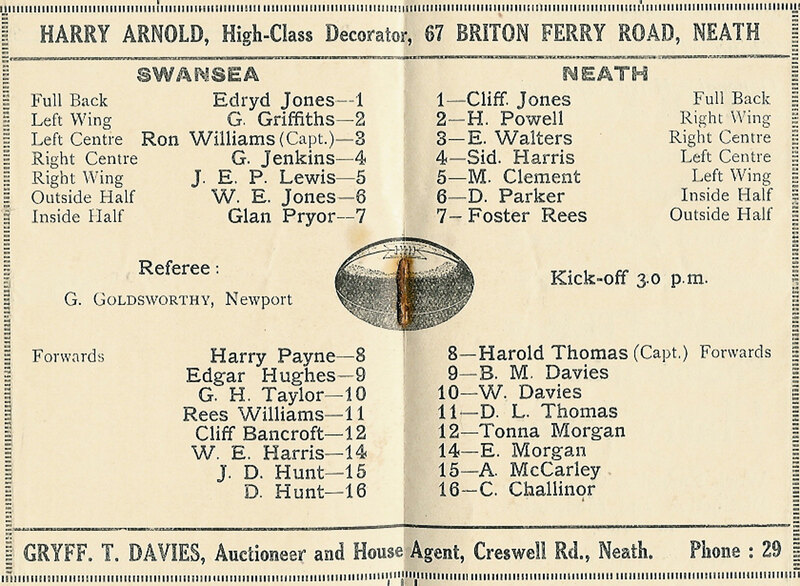 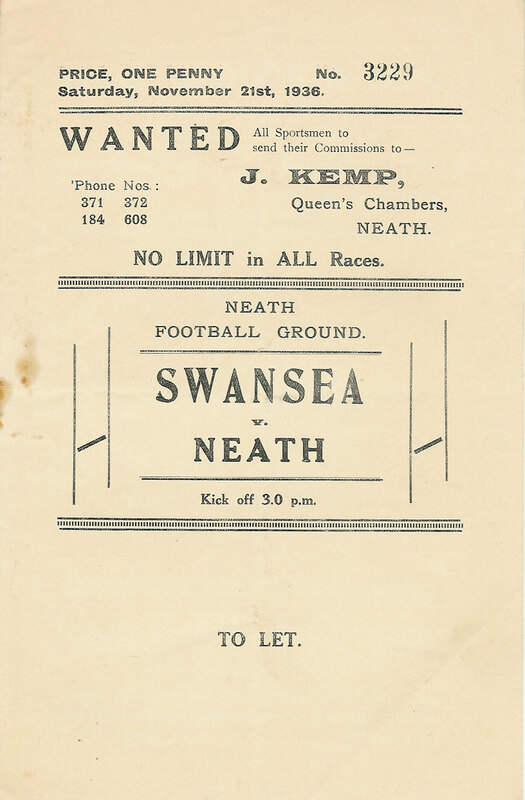 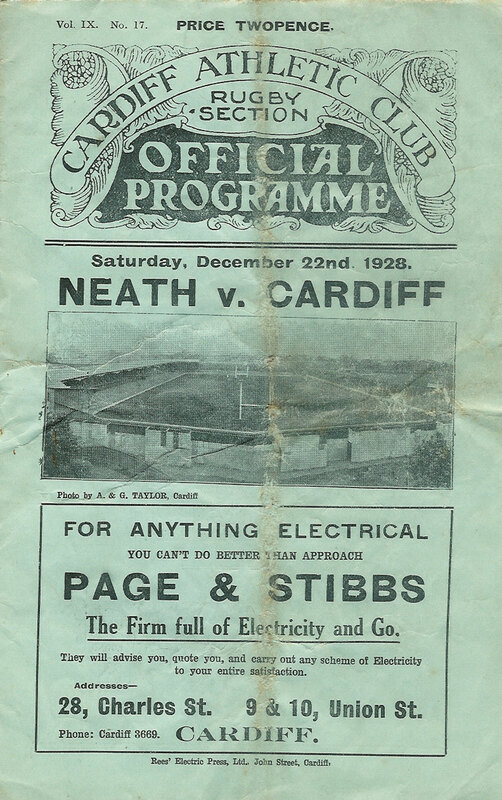 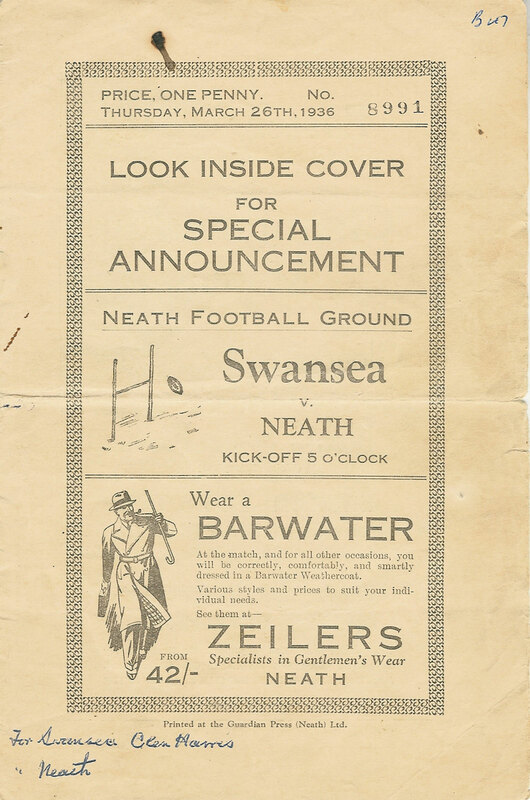 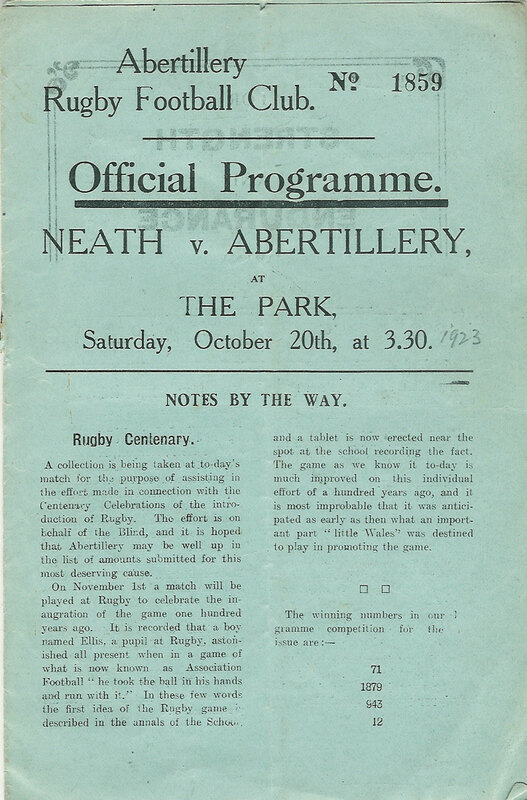 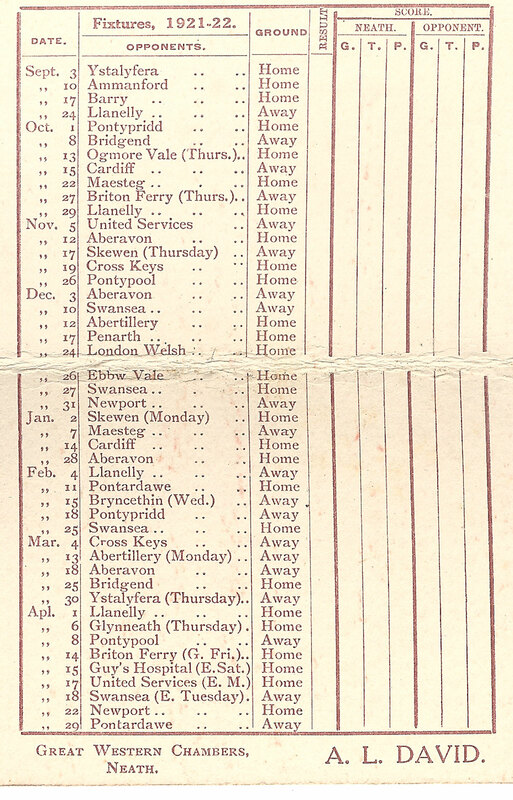 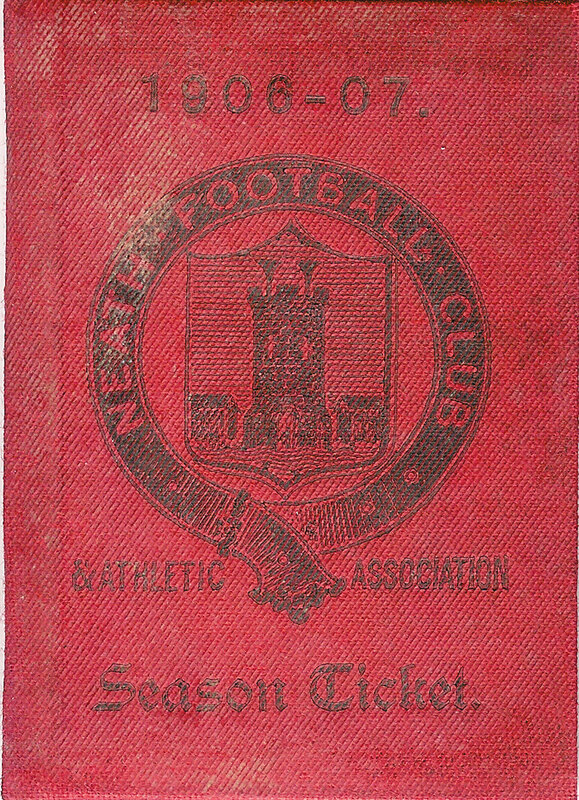 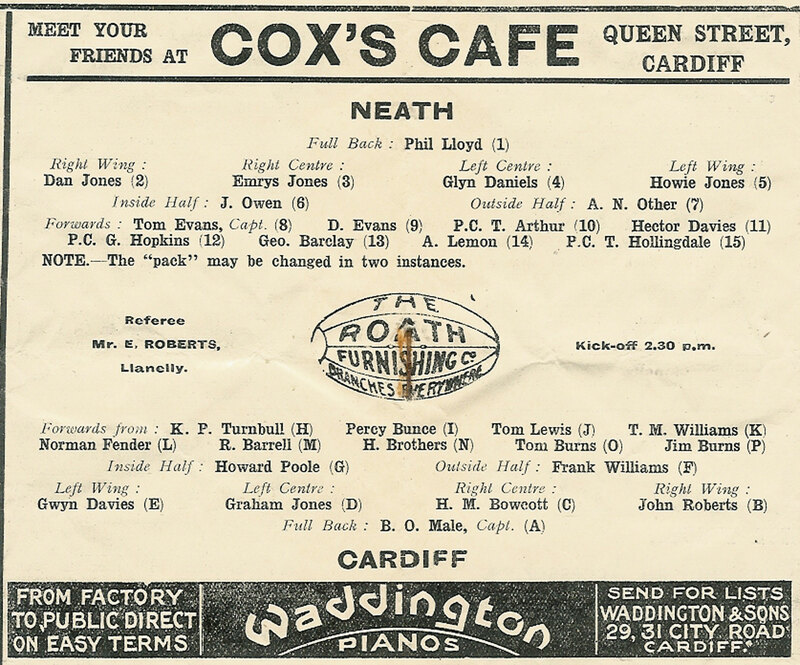 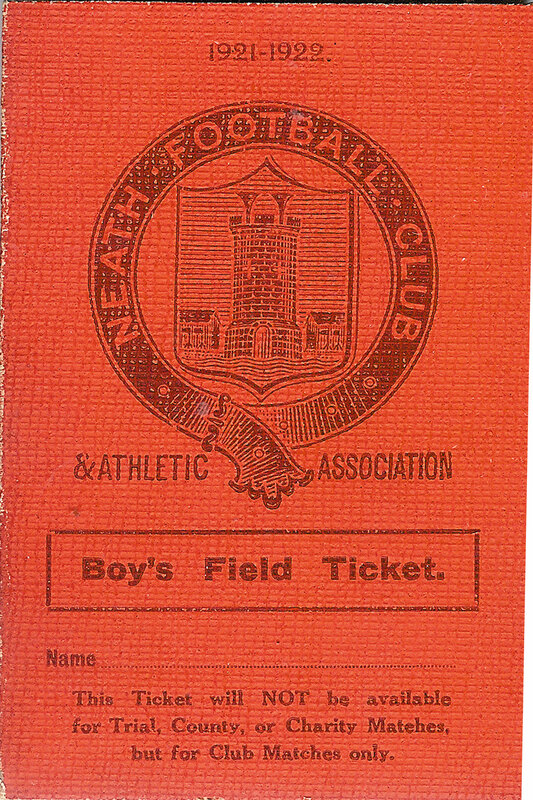 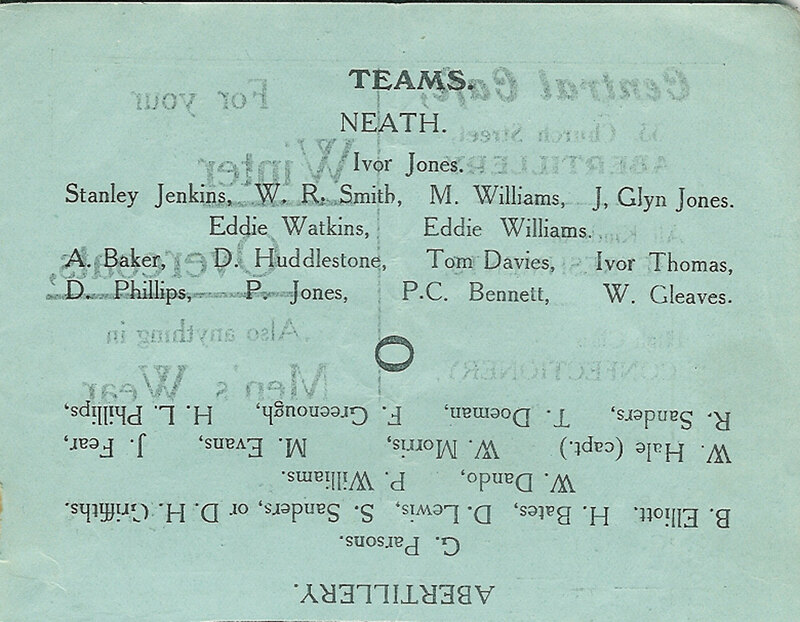 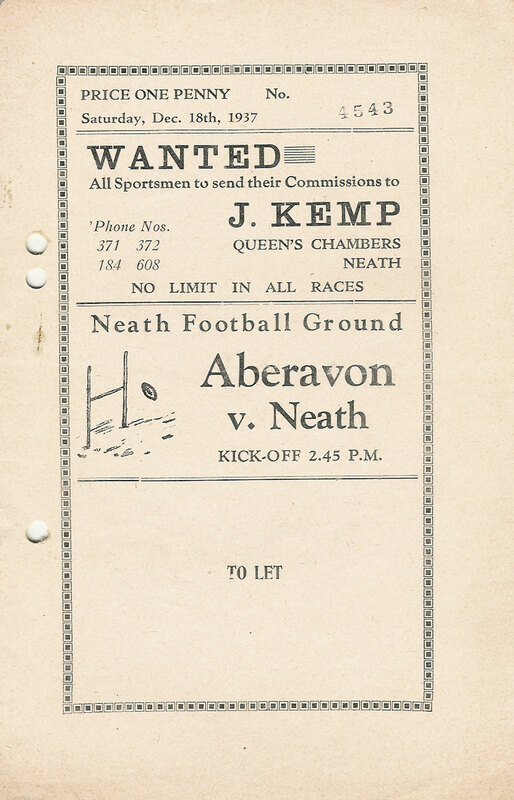 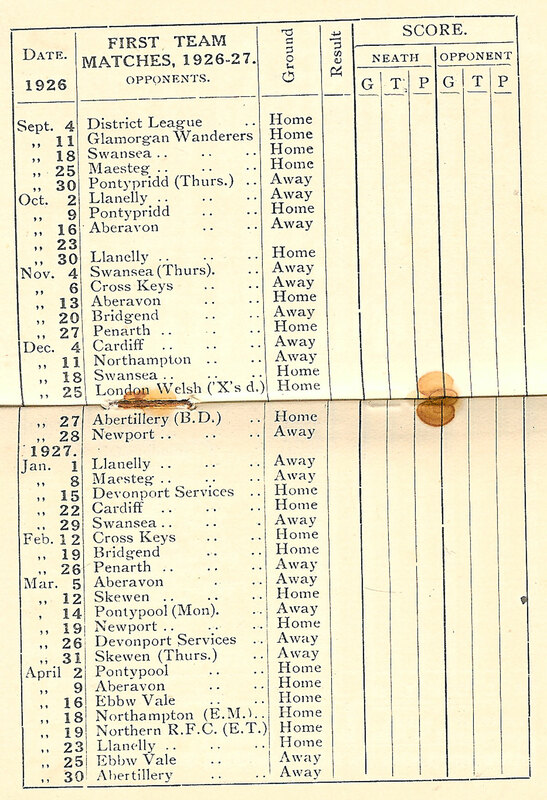 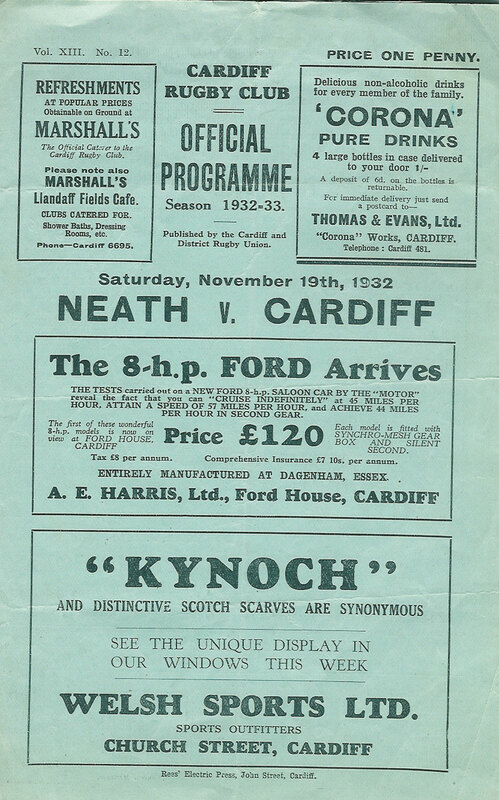 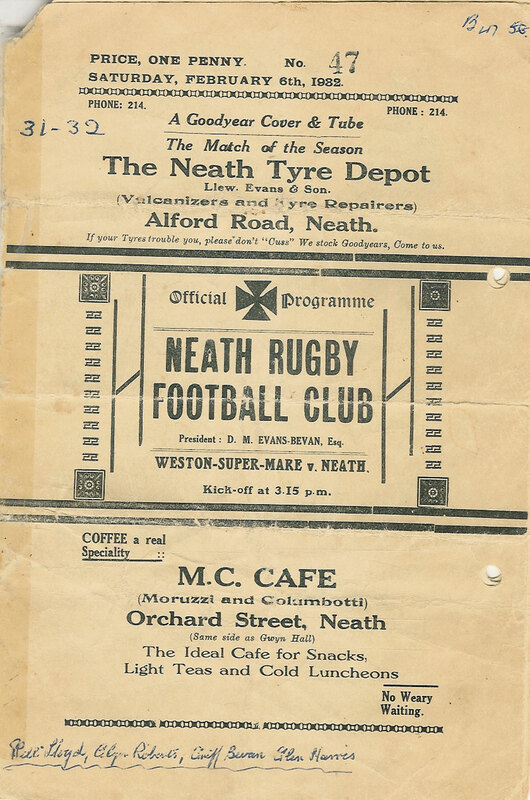 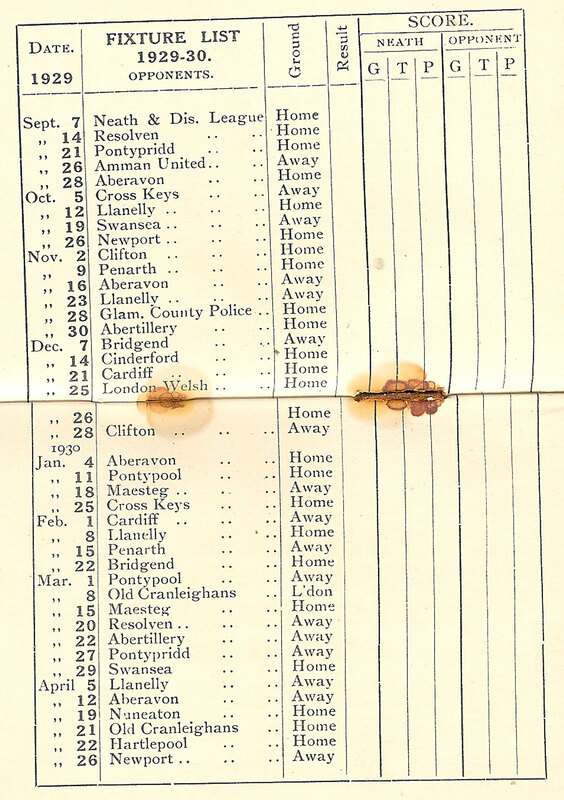 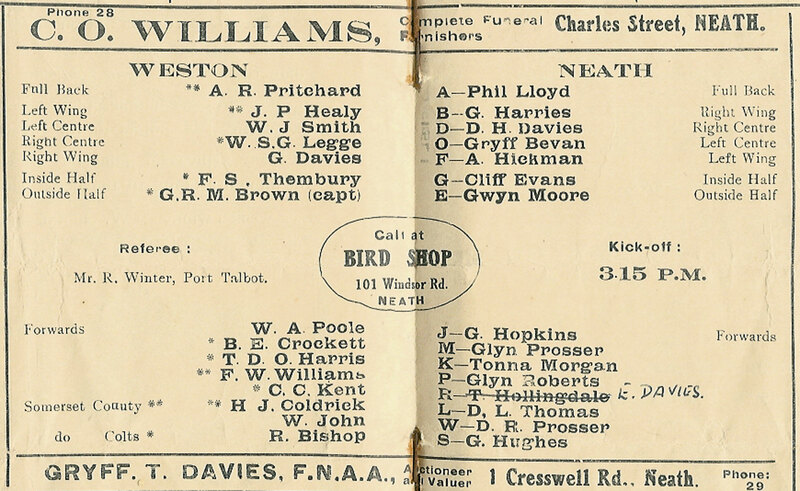 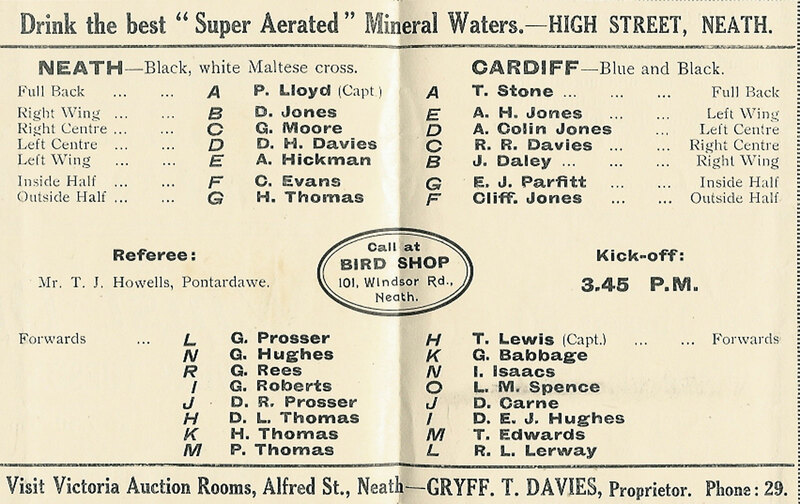 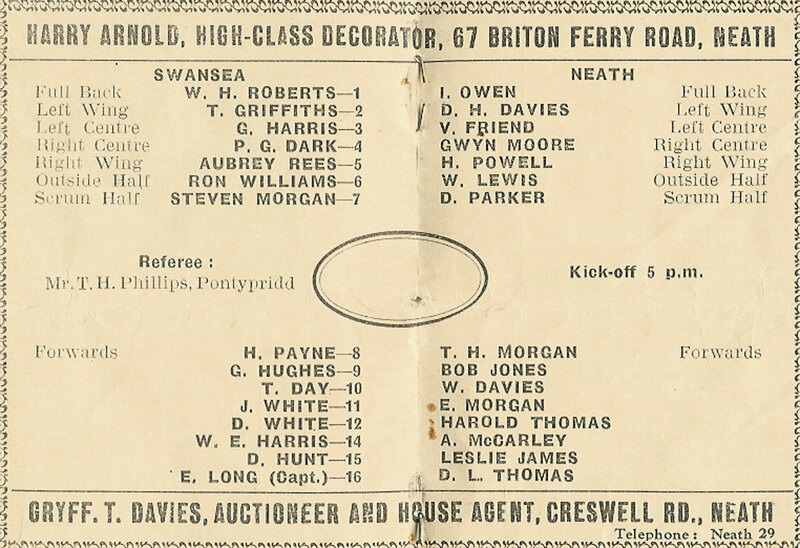 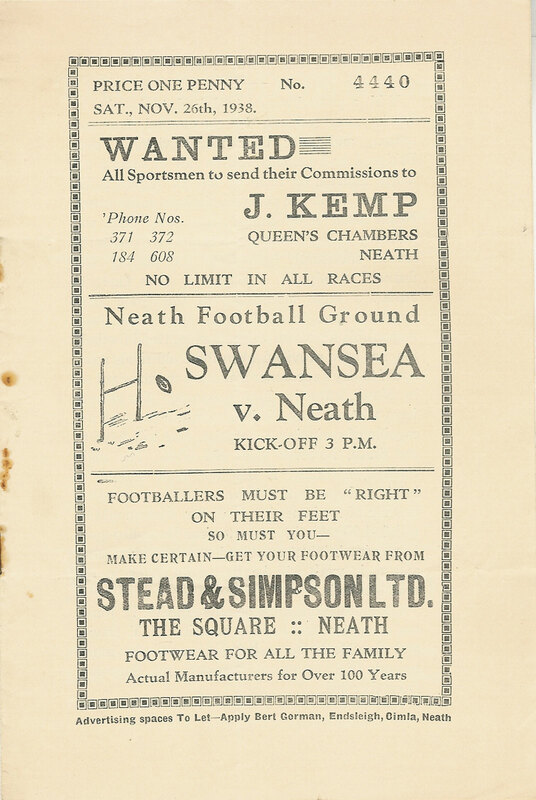 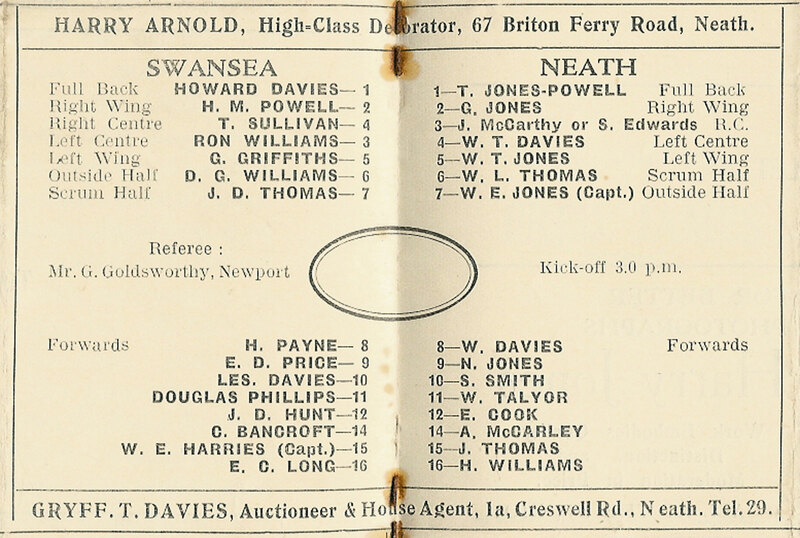 Neath v Weston-Super-Mare 6th February 1932, a programme from the Glenn Harris collection. 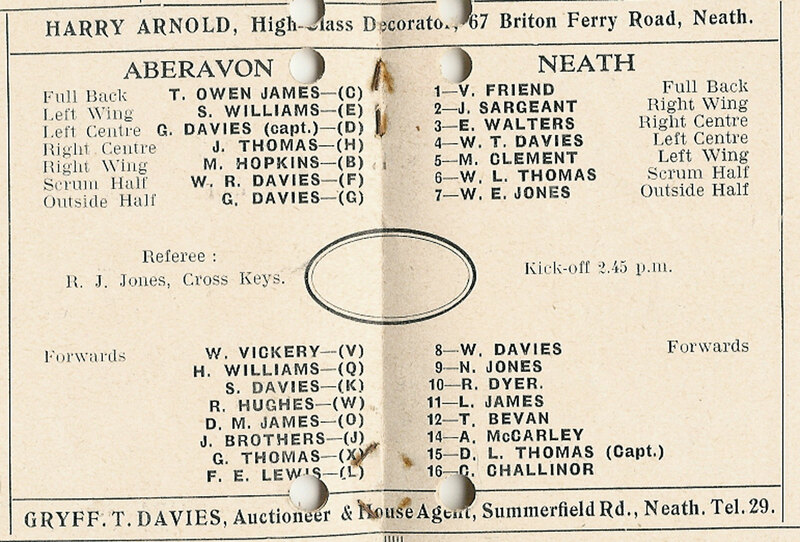 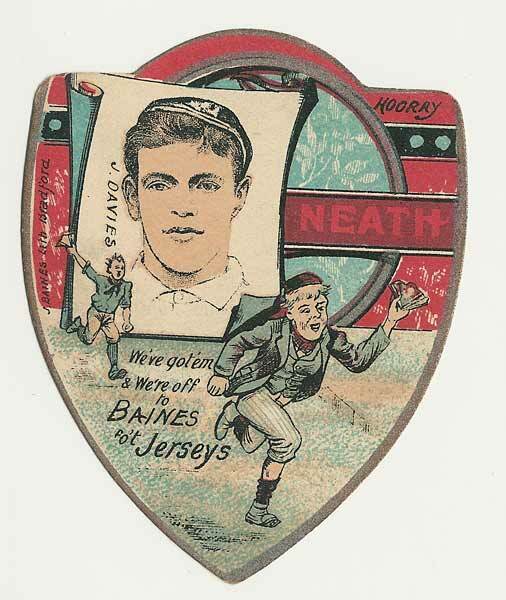 It is interesting to note that Neath are playing in letters rather than numbers (when did they change to numbers ?). 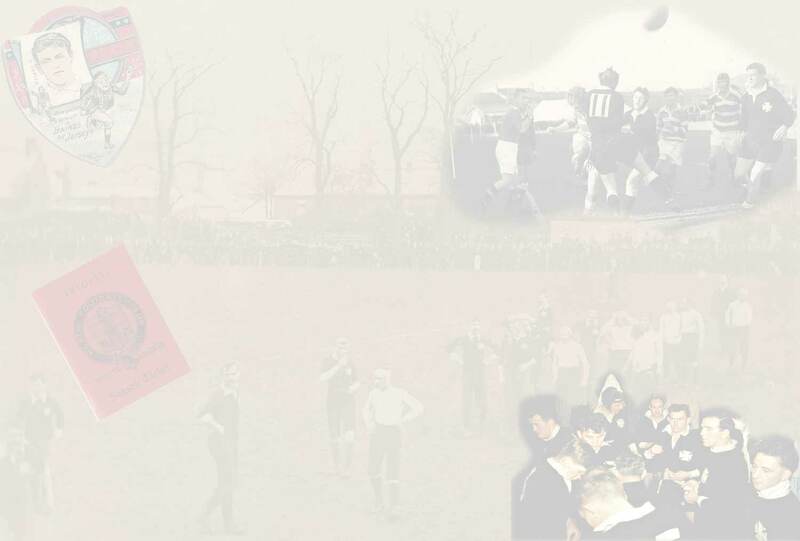 Programme notes include new fixtures against Devonport Services, London Hospital & London Irish and the Supporters Club fund for new dressing rooms.